[BEAVER, W.Va.] Transform your experience outdoors by learning to identify birds by appearance and call in classes at three New River Community and Technical College campuses. 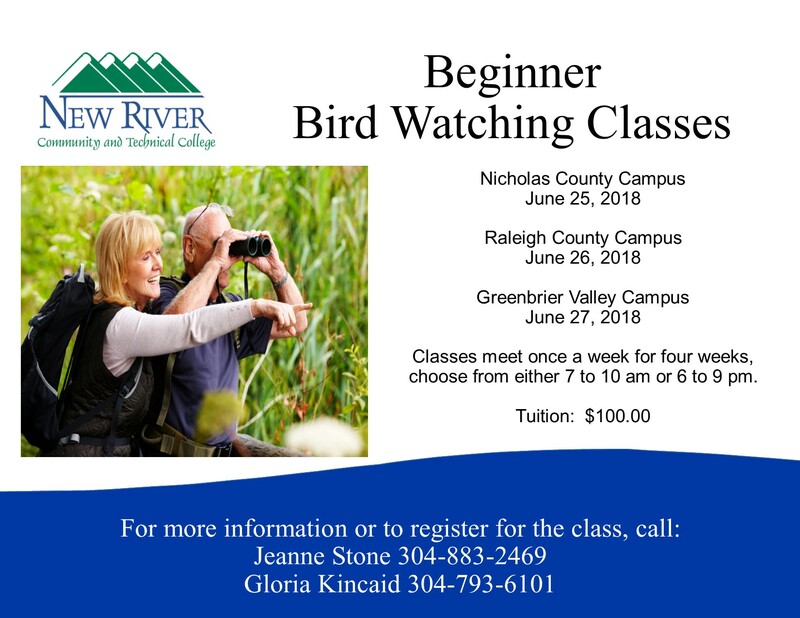 Four-week Beginner Bird Watching classes are scheduled from 7 to 10 a.m. and 6 to 9 p.m. on Mondays starting June 25 on the Nicholas County Campus, Summersville; Tuesdays starting June 26 on the Raleigh County Campus, Beaver; and Wednesdays starting June 27 on the Greenbrier Valley Campus, Lewisburg. Through classroom instruction and outdoor experience students will learn to identify birds by sight and sound, how bird species relate to each other, bird behavior and feeding habits, and basic anatomy of bird flight. Instructor Suleka Deevi has been avidly watching and studying birds for over 10 years. She enjoys listening to the intricate differences between various bird calls and songs, while noticing bill shapes and behaviors that indicate feeding and habitat preferences. Her teaching focuses on the ecological relationships between flora, fauna and the natural elements to equip students with a fuller understanding of the natural world. Tuition for the 12-hour class is $100, and pre-registration is required. Classes will meet four times during June and July. For more information about workforce classes at New River CTC or to register contact Gloria Kincaid at 304-793-6101 or gkincaid@newriver.edu or Jeanne Stone at 304-883-2469 or vstone@newriver.edu.